Dr. Kris Stockton knows a thing or two about ankles and feet. Some of you may remember him kicking that winning field goal for the big UT/A & M game back in 1995. Now he’s using his talents and gifts as a board-certified orthopedic surgeon with Texas Orthopedics specializing in the foot and ankle, and he recently helped one of his own patients get back on his feet, so to speak. Gustavo Tostado first visited Dr. Stockton for severe ankle pain and discomfort that kept him from doing basic activities in his everyday life. “I couldn’t go on a field trip or on a showing because of my ankle. I just couldn’t get out of my bed or I couldn’t get out of my chair,” said the 38-year old Tostado. After discovering he had a cystic defect in a bone in his foot, Dr. Stockton recommended a procedure known as cartilage regeneration. This type of ankle surgery involves taking a bone graft or cartilage from another part of the body – the knee in Tostado’s case—then implanting it into the spot where newer, healthier cartilage is needed. This procedure is particularly well-suited for the ankle joint, and for Tostado, it was a complete success. He says he is now pain-free and able to get back to his work as a realtor, sharing homes with families all day on his feet, and the other activities that he loves. 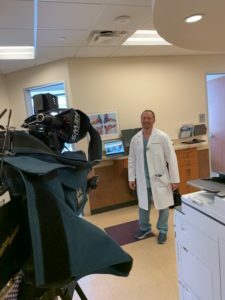 More about Gustavo Tostado’s story and Dr. Stockton’s work on cartilage regeneration can be found in this recent feature on Spectrum News. To make an appointment with Dr. Stockton or any one of our board-certified foot and ankle specialists in Austin, please visit us online anytime.